What are medication records in the My Health Record system? Healthcare professionals who use clinical software to prescribe and dispense medications can also upload a copy of this information directly to a patient's My Health Record. These medication records can be viewed in the My Health Record system as clinical documents, and are also displayed in the Prescription and Dispense View, which allows individuals and their healthcare providers to easily view details of their prescribed and dispensed medications. The view displays the name and date a medication has been prescribed and dispensed (both the brand name as well as the active ingredient/s), the strength of the medication (e.g. 2mg, 20mg, etc. ), the direction for consumption (e.g. take one capsule daily) and the form of the medication prescribed (e.g. capsule, tablet, inhaler, etc.). If a patient has a My Health Record, their healthcare provider is using Electronic Transfer of Prescriptions (ETP) and is registered with the My Health Record system, a copy of the prescription information will flow through to the My Health Record system via the Prescription Exchange Service (PES) and be visible in the Prescription and Dispense View (as long as the patient has not withdrawn their consent for the information to be uploaded). 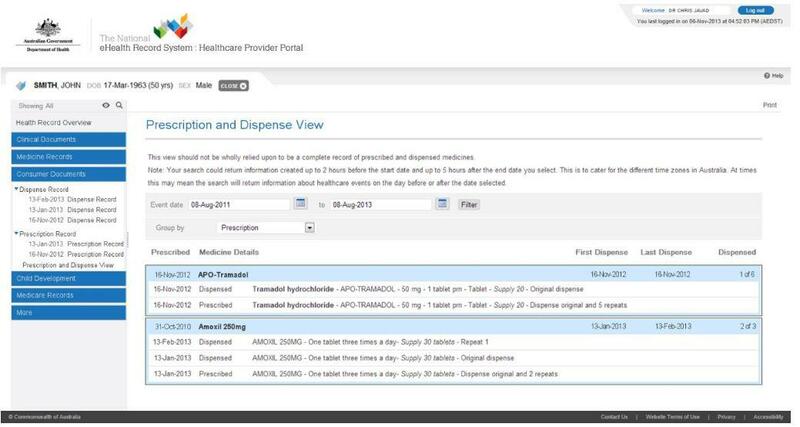 The Prescription and Dispense View is an important feature of the My Health Record system. This feature has been built to provide a convenient way to view a patient's prescribed and dispensed medications in one place. Healthcare professionals who use clinical software to prescribe and dispense medications can send this information directly to a patient's My Health Record. Each software vendor has their own 'look and feel' for how to go about uploading and viewing prescription and dispense information, but the actual documents in a My Health Record will be the same regardless of the software used.